In Darth Vader #21, we learn why Vader has returned to Mustafar. The work begins for his castle, and Charles Soule picks up on an old story thread from his Lando series. We get a name for that haunted Sith helmet, the Mask of Lord Momin. We also learn that the mask and Vader’s castle are intertwined. While this is part three of the “Fortress Vader” arc, this is the first one that actual deals with his fortress. Vader arrives on Mustafar with a couple Imperial engineers in order to begin construction on his castle. However, one of Palpatine’s gifts has a very important impact on that project. Along with Padme’s ship and the planet Mustafar, Palpatine also gives Vader the Mask of Momin, a relic of a Sith who like to create rather than destroy. It’s kind of hard to argue how the helmet reflects that aspect since it seems to drive everyone around it into murder, but it did wind up showing Vader a design for his fortress. The question is where the story will go from here. Keeping his cards close to his vest, Soule creates some tantalizing story threads and suppresses others from the readers. We know Vader chose Mustafar because of the dark side locus he touched there when bleeding his lightsaber crystal. However we don’t know what Vader hopes to accomplish with it, or if he himself even knows. We know the helmet has some kind of power, and that it was owned by a Sith who liked to create, but we don’t know how this is going to link up with Vader and his fortress. Is there more to the castle than a simple structure? The story certainly keeps the interest going, and it’s an intriguing story. The artwork is pretty good overall. Some panels look great, some are a little odd. Giuseppe Camuncoli has an odd way of depicting human characters than can make them look a little ghoulish, but it’s not a huge problem. The coloring and lighting throughout is top notch. There’s tons of detail and the panel layouts are great. 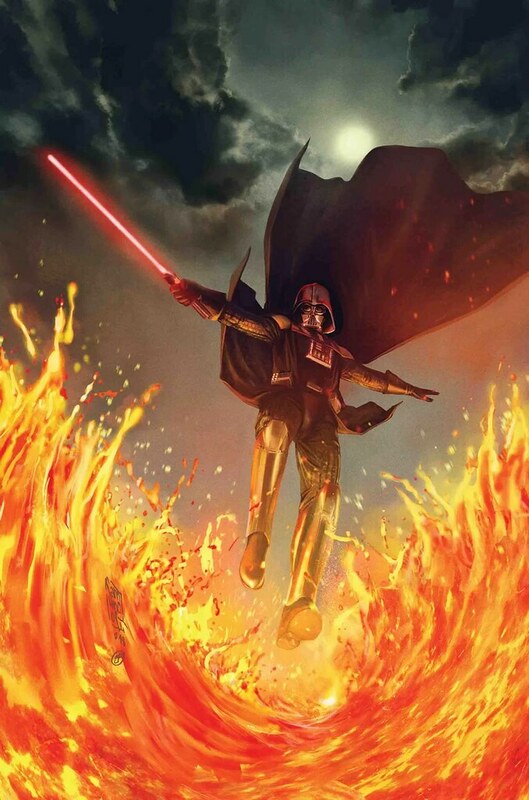 With good artwork and a great story, Darth Vader #21 holds a lot of promise. While this is but a step forward in a larger story, it’s looking like a good one. I give this issue a five out of five metal bikinis.